One of my favorite chapter books to read to preschoolers and kindergartners is Jenny and the Cat Club . It makes a purr-fect present with a little stuffed animal, naturally a little black cat with a red ribbon tied around its neck. If you're looking for a chapter book to read with your little one, all about friendship, courage and adventure, take a look at this classic tale. It also works beautifully with 2nd and 3rd graders looking for an absorbing tale to read on their own. Jenny is a little black cat who is taken in by Captain Tinker, a sea captain and gentle old man. Jenny is a shy little cat, who loves looking out the window at the cat club that gathers at night in the garden below. With the help of the special red scarf that the captain knit for her, Jenny musters the courage to introduce herself to the cat club. But she will need a special talent to join the club. Whatever might that be? 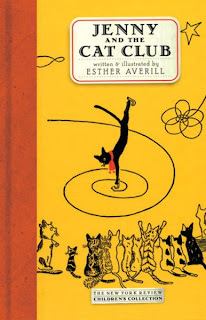 Pair this sweet book with a little black cat , and you have a purr-fect present. If you can, it would be extra special to have an older brother or sister finger knit a little red scarf for the special kitty! Enjoy, and share the gift of a book this holiday season. The review copy came from our personal library. This is a book I will keep for my children to pass down to their children. It was recommended by our wonderful neighborhood bookstore, Mrs. Dalloway's Books, in Berkeley. Do you have a young naturalist? How many times have you been at a soccer game when some kid seems more fascinated by the bugs crawling around in the grass than the game at the other end of the field? Bugs fascinate kids! Continuing our Ways to Give a Book, this holiday why not give your budding nature-lover a butterfly net and Face to Face with Butterflies , published by the National Geographic Society. This series by National Geographic use bold, bright photographs and personal stories of scientists and photographers in the field to engage children. Face to Face with Butterflies provides interesting, clear factual information about butterflies: how they eat, how they compete with each other for food, how they migrate across large distances. The writing is crisp and clear, and provides a nice detailed introduction for bug-loving kids. Side-bars, like "how to attract butterflies" and "how to plant a butterfly garden" provide extra information. Murawski is a noted photographer and biologist who specializes in butterflies and other insects. A butterfly net is essential equipment if you want to study butterflies up close.As Face to Face with Butterflies explains, it is important to never touch a butterfly's wings. A butterfly net will allow you to catch a butterfly and observe it up close before releasing it or transferring it to a small screened enclosure. And what fun for a young naturalist to have their own butterfly net! Flight of the Butterflies , by Roberta Edwards - an introduction to the migration of the Monarchs, part of the All Aboard Reading series for beginning readers. New readers are fascinated by animals, and I'm really looking forward to seeing this. Summer Birds: The Butterflies of Maria Merian , by Margarita Engle - a picture book biography of the young German girl who observed caterpillars transforming into butterflies in the 1600s. For more nonfiction, head over to Playing By the Book for the Nonfiction Monday roundup from across the Kidlitosphere. Lots of great resources! The review copy of Face to Face with Butterflies was kindly sent by the publisher. If you make a purchase using the Amazon links on this site, a small portion will go to Great Kid Books (at no cost to you). Thank you for your support. Hitting off our feature: Ways to Give a Book, I'd suggest a brand new baseball glove and the fantastic book Six Innings , by James Preller. Two teams battle for the little league championship baseball game, in this gripping sports novel. Sam is the game’s announcer – he’s injured and so can’t play, but he lives through each moment of the game. Kids will love the way Preller captures the rhythms of the game, routine plays, surprises and strategic moves. It’s full of suspense and excitement as you root for each team. I really loved how the story brought you into how different players felt at each small moment of the game, play by play. As you get into the story, you realize that Sam’s life has been upended by bone cancer, and he’s struggling with more than typical injuries. But his friendships come through in the end. James Preller has a wonderful site and blog to check out. He's a tremendously versatile author, writing short chapter books for young readers (the Jigsaw Jones series) and serious, thought-provoking novels for young adults (Bystander ). The review copy came from my personal library. If you make a purchase using the Amazon links on this site, a small portion will go to Great Kid Books (at no cost to you). Thank you for your support. Inspired, as always, by the inimitable MotherReader (see her amazing 105 ways to give a book feature), I would love to share with you ways to give a book. My children do groan, but every time one of their friends has a birthday, I find a way to give a book that ties in with the present we're giving. So this holiday season, I will be starting a feature: Ways to Give a Book. We'll be pairing books with art supplies, stuffed animals, sports balls - you name it! Books for older kids and young ones, too. I'd love your ideas to share - so send me an email (greatkidbooks at gmail dot com) or leave a comment. What's your favorite way to give a kid a book? "Mom, it's almost Christmas!" my littlest one shouted this morning when she looked at the calendar. * include books for your children as you think about holiday gifts. While books might not grab their attention right away, they have lasting power. At times, a book seems expensive at $15 - $20, but then I take a minute to think about the amount of time and pleasure we get from a book. My older daughters are both reading Rick Riordan's Lost Hero right now, so that $10 has been spread across two children for hours and hours of reading time. Compare that to a movie ($50 for the family, easily), and books seem like bargains! * include books in your gifts to charities. Our neighborhood does a charity drive every winter for a local women's shelter or the local children's hospital. Gifts of children's books can be especially meaningful for children struggling at this time of year. Books can help pass the time, they can help you escape in your mind, and they can bring laughter at hard times. I pass on books we're no longer using, and include some new popular books that I know kids will love. * if you shop on Amazon, please first visit Great Kid Books and then click over on a link to Amazon. Great Kid Books gets a small percentage of every sale - money that helps us buy the newest books to review and share with kids and readers. Anything purchased from Amazon counts here - from candles to Kindles , toothbrushes to toys , not just books . Thank you for your support, and for helping your children find wonderful things to feed their imagination. Holidays bring families together, and we've been reading about families with our kindergartners and at home. With a family of 3 girls, we know all about big sisters and little sisters. They play together, they talk non-stop, and they drive each other crazy! Two books that capture this perfectly are Big Red Lollipop and Big Sister, Little Sister. Both are perfect for preschoolers and young kids learning to read. When Rubina is invited to a birthday party, her little sister Sana screams and has a fit that she wants to go too. Their mother insists that Rubina brings along her little sister, and Rubina is terribly embarrassed, sure that her mother doesn't understand her or American birthday parties. A few years later, when Sana gets her own party invitation, the tables are turned and the littlest sister starts begging to be included. Siblings everywhere see themselves in this story, understanding how parents ask big sisters to take care of little ones. This tale is rooted in the clashing cultural expectations that new immigrant families experience, but it connects to feelings that many siblings experience. The illustrations, by Sophie Blackall (known for her Ivy & Bean illustrations) are wonderful: colorful, inventive and expressive. This fun book, illustrated in spirited, cartoon-style pictures, shows life from a little sister's point of view. "The Big Sister thinks she's always right. I'm the Little Sister. I know I'm right." Life is full of hand-me downs, early bed-times and always trying to catch up. But this book also celebrates the good side of being a little sister - listening to stories your big sister tells you, sneaking behind the sofa to watch your sister's TV shows, and getting piggy back rides. This is a simple, fun book perfect for sharing with big sisters or little sisters. LeUyen Pham is a wonderful illustrator, whose work I first got to know through the Alvin Ho chapter books and the picture books Grace for President and God's Dream . She captures the ups and downs of being a little sister. As she writes in the dedication, "For Big Sisters everywhere, and for one in particular ... my Big Sister, Lechi Pham. You were always the first at everything, and now you're in my first book!" This is a treasure and a keeper! The review copies came from my local library and from my home collection. If you make a purchase using the Amazon links here, a small percentage will go to Great Kid Books (at no cost to you). Thank you for your support.